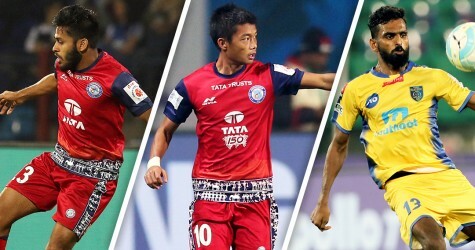 Beevan D’Mello and Kapil Hoble scored for the Golden Eagles, while Clencio Pinto reduced the margin for the Green Brigade. Dempo Sports Club got back to winning ways after defeating Salgaocar FC by 2-1 in the Goa Professional League match played at Duler Stadium earlier today. 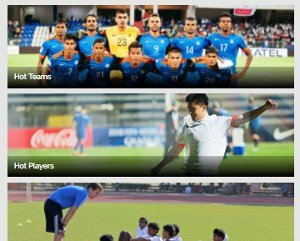 Salgaocar coach Norbert Gonsalves made three changes following their narrow defeat against league leader Sporting Clube de Goa as Samuel Costa, James Fernandes and Stephen Alvares made into the starting XI, while Dempo who went down to FC Goa in the last match also made the same number of changes as Nickson Castanha was back. Desmon Pereira and Latesh Mandrekar were the other changes in the in the starting XI for the Golden Eagles. 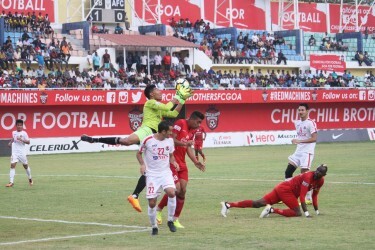 The first 20 minutes were restricted to midfield play where both the teams tried to keep the ball, however in between this, both the sides got a chance each as first Dempo’s winger Kapil Hoble headed pass to Latesh in the box, off Naveen Mendes’s long cross, but the striker failed to put power in his shot from inside the box. Whereas, Salgaocar wasted an easy chance to go into the lead when their U-20 striker Devendra Murgaonkar failed to connect free header from close off Gilbert Oliveira’s curling cross. At the other end, Dempo came with another chance in the 26th minutes as Velito Cruz combined well with Beevan D’Mello for one-two-one passing and fired a powerful shot on the goal but Salgaocar keeper S. Rajini Kumar made a diving effort to push it for a corner. From the resulting corner, Desmon tried his luck from the edge of the box only to see it denied by the crossbar but well position Beevan tapped-in from close off the same to take Dempo into the lead. 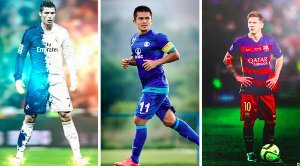 Dempo doubled their tally in the 41st minutes when Kapil made a swift run cutting past two defenders on his way and brilliantly shot past keeper Rajini from the top of the box to make it 2-0 for the Golden Eagles. On crossing over, Salgaocar had a chance to reduce their margin in the 52nd minutes when their Nigerian striker Joel Sunday nicely curled the ball to Devendra in the box but the U-20 striker failed to connect from the close. A few minutes later, Beevan made a run on the right flank before curling it to Desmon in the box but his shot was brilliantly blocked by Salgaocar defender Joaquim Carvalho. At the hour mark, Salgaocar finally found the net when Sunday’s powerful strike was blocked by Dempo keeper Agnelo Gomes but substitute Clencio Pinto tapped-in off the rebound to make it 1-2 for the Green Brigade. Energized by a goal, Salgaocar came out all attacking and almost dominated the rest of the session with continues attacks where they almost scored on a couple of occasions but first Dempo’s most experienced defender Mathew Colaco came up with a superb clearance when Sunday was just left with keeper Agnelo to beat. Whereas, Nickson made an excellent clearance to substitute Agnelo Colaco’s goalbound attempt to book all three points from the tightly contested match. With this win, Dempo kept their hopes alive in the title race as they stand 2nd behind league leader Sporting, with 27 points from 12 matches, while Salgaocar struggling in the bottom half of the table with 11 points from 10 matches.